At the end of the year Daugavpils Mark Rothko Art Centre has been admitted to Latvian Museum Association with the decision of the organization’s board on December 17, 2014. 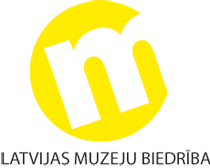 Latvian Museums Association is a non-governmental organisation which comprises state, municipality and privately owned museums for realisation of common goals and advocating for sector’s interests. The mission of LMA is to enhance the value of museums to society by sharing knowledge, developing skills, inspiring innovation, and providing leadership. We advocate for museums, run museum sector’s informative platform, offer continuing professional development and expression opportunities.